The Illankai Thamil Arasu Katchi (ITAK) has withdrawn the petition of No-Confidence submitted to the Governor, against Chief Minister C. V. Wigneswaran. Wigneswaran yesterday ceded to the call of the leader of the Tamil National Alliance (TNA) and agreed to permit two ministers to continue to work, until the fresh probe is concluded. 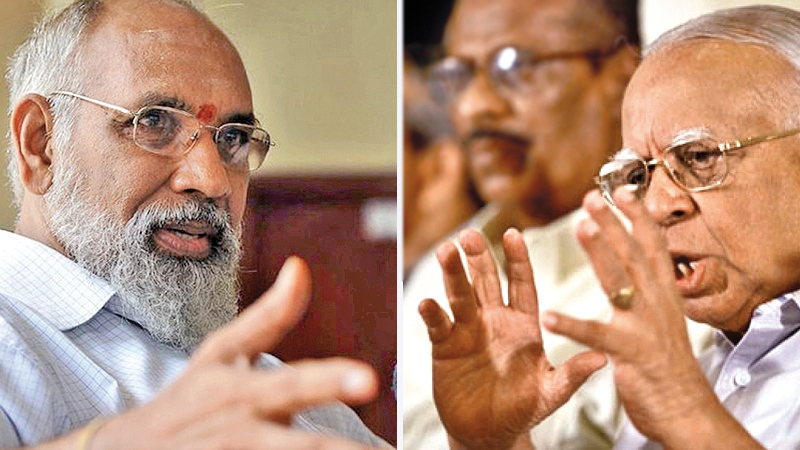 The issue which brought the North to a standstill and the TNA almost left in tatters, came to a temporary halt after Wigneswaran agreed to permit Balasubramaniam Deniswaran and Dr. Pathmanathan Sathiyalingam who were to be subjected to a fresh probe, need not go on leave until the inquiry is complete. “There was no punitive action taken against the two Ministers concerned. They are entitled to draw their salary and use their vehicles etc. It is in order to give protection to the Witnesses that it was said that they should take leave while the Inquiring Committee sat,”wrote Wigneswaran to Sampanthan yesterday. “There are new charges too against them. I understand your inability to give guarantees with regard to the conduct of the two Ministers. But I am glad you have undertaken to advise them that they should not impede an independent legal inquiry. It is to ensure the independent legal inquiry and to commit the two Ministers that I designed the formula of taking leave for one month”, he further added. The CM who then agreed to take Sampanthan’s word that he advised the two ministers not to interfere in any inquiry added that, “The two Religious Dignitaries have insisted that the two Ministers must co-operate by not interfering with the course of justice”. On Monday, prominent religious leaders such as Srila Sri Somasundra Thesika Gnana Sambanda Paramachchariyar Swamy Peedathipathy of the Hindu Nallai Aatheenam and Catholic Bishop of Jaffna, Rev. Justin Bernard Gnanapragasam visited Wigneswaran to sort out the issue in an amicable manner. Furthermore, Selvam Adaikalanathan, Dharmalingam Sidharthan and Suresh Premachandran, wrote the CM, had “undertaken last night in the best interests of the Tamils to speak to the Hon’ Ministers, to make sure they will not interfere with the course of justice nor interfere with nor threaten witnesses nor tamper with evidence etc. In the light of these undertakings, I will not insist on the conditions relating to leave”, concluded Wigneswaran. A corruption probe on all four ministers of the NPC initiated last year had cleared the two ministers Deniswaran and Sathiyalingam while finding the other two; Thambyrajah Gurukularajah and Ponnuthurai Ayngaranesan guilty of corruption. Wigenswaran thereafter had insisted that the former two ministers that a new committee would be appointed to investigate the exonerated ministers further. Until such time, he had asked the two ministers to go on compulsory leave. This stirred 15 members of the ITAK, the main constituent party within the TNA in the NPC, along with five opposition members to submit a Motion of No-Confidence against the CM. Sampanthan who stepped into resolve the crisis had asked that Wigneswaran act in a fair manner and that he could have his investigation but let the two exonerated ministers carry on with their work. Wigneswaran however had asked that Sampanthan give him a written guarantee that the two ministers would not interfere in the probe, to which Sampanthan refused and said he would simply advise them not to do so. As the CM and TNA Leader clashed, cracks within the TNA has become more apparent with minor parties such as TELO, PLOTE, TELO and EPRLF even threatening to sit independently of the TNA within Parliament if the No-Confidence Motion was not withdrawn. Wigneswaran’s latest stance however is expected to patch up things within the TNA and have the ITAK withdraw its Motion against the CM. Jaffna based Academic, Prof S. Ratnajeevan H. Hoole speaking to Daily News however observed that all compromises would be temporary, “If it works, it will work for a short time but the differences are basic. The policies of the two groups are incompatible. Some of them are still carrying anger over the old Federal Party Divisions and they want to break the Federal Party”, he said. The TNA consisting of the ITAK, PLOTE, TELO and EPRLF, he explained had come together because of an “electoral need but there is nothing common thinking to keep them together”, added Prof Hoole. “While Sampanthan is negotiating within the extremist groups within the TNA, he is also taking a moderate position and dealing with the government. He will be weakened by a split and will not be able to negotiate with the government. Many of Sampanthan’s requests are just but the government is under pressure not to give in as it keeps looking at the Sinhala vote. If there is a break, Sampanthan won’t have much to offer in terms of cooperation if Parliament”, said Prof.Hoole. The recent fiasco in the NPC however has also shown the rising popularity of Wigneswaran and his views, “His popularity is growing because the government is not delivering on many of their promises. In Jaffna many of the upper class people tend to align with him. While it is mostly the poor who have suffered due to issues over land and disappearances, the government has done little in terms of governance and there are still very few Tamils recruited to government service- these are all problems of the middle and upper middle classes”, added Prof Hoole. He further pointed out that it was mostly doctors, university staff and university students who were supporting the Chief Minister, “the loud crowd came from the University”, said Prof Hoole. “Wigneswaran had created a serious problem for Sampanthan who brought him into the party and then betrayed him”, he said. These Tamil politicians are not genuinely representing and contributing anything for Sri Lankas interest. They fight among themselves on the pretext to create attention but Only act on the Tamil ltte/Diaspora/transnational agendas. Throw all of them out and get people wanting to contribute and improve Sri Lanka as One Nation.